Hebrew Word Roots are the base on which the Bible is written. They’re impossible to fully translate. How can they be fully understood? Biblical Hebrew roots are impossible to fully translate. Therefore it is impossible to fully understand the meaning in your native language. Biblical Hebrew roots and Hebrew word stories are the final two keys of our series to master Biblical Hebrew. Both of these principles are basic, especially the latter. Yet, most Bible readers are not aware of them. Even religious (as differentiated from ‘intellectual’) Bible scholars are unaware of the most important seventh key. Each biblical Hebrew word has a ‘base’, a common denominator on which it’s built. Here’s an English example of a family of words with a common thread: ocular, utrocular, monocle, monocular, binoculars, oculus, oculist. You might not know the meaning of all these words but you can spot the common denominator: oculus – pertaining to the eye. In English we practically never refer to the ‘common root’ of words but, in Biblical Hebrew (and in modern Hebrew) we do. Roots are a fundamental key to understanding meanings and relationships. The Hebrew Bible actually only contains about 8600 different words repeated over and over to compose the text. These 8600 words are built on about 2000 roots, or fundamental building blocks like ‘oculus’, from which other words are constructed. Understanding this, helps us grasp the relationships between words, some, even most, of which are not evident as first sight. We’ve already seen examples of this with ‘rosh – head – beginning’ and ‘noah – quiet – rest’ as well as with ‘lechem – eat – war’. Every word in Biblical Hebrew is either a root or the derivative of a root. It is impossible to see this in your native language where totally different unrelated translated words, like the three examples above: head/beginning, quiet/rest and eat/war, cannot render full meaning when taken separately. Another factor to do with the 2000 roots is that some of the roots are actually inter-related, further enhancing the relationships and meanings. I can’t get into it here but, for those who know a little Hebrew, here’s the transliteration of three words: yashav, shevet, shoov. Their basic meanings include: ‘sit’, ‘Sabbath’ and ‘return’. I say ‘basic meanings’ because, as we saw with ‘noah’ there are multiple native language translations for each of these three roots. When you read any of these three words in your native language there’s absolutely no way of even knowing they have a common root, let alone realizing there’s an indelible relationship between those three concepts. I’ll even go so far as to say that for most scholars who read and study Biblical Hebrew this relationship is unknown. For those not aware of this, the common denominator of yashav, shevet and shoov consists of the 2 letters ‘shin’ and ‘beth’ (pronounced here as a ‘vav’). Needless to say, it is impossible to see these roots and hence these intricate and revealing relationships in any translation. I repeat, the native language translations of these words are correct. But they reveal a very, very limited amount of information. It is impossible to have complete understanding. If you reread the above points, you’ll now realize that each Biblical Hebrew word: elohim, rosh and noah is either a root (rosh is the only one here) or a derivative of a root. The point being you’re beginning to see fundamental concepts in Biblical Hebrew that open up more complete understanding of this best-seller, the Bible. Whether you believe the Bible or not, it’s full of ‘words’ that will open up this literary marvel as never before. I’ll show you how to easily and quickly identify Biblical Hebrew word roots and find all the derivatives and their meanings. We’ll be discussing this in the Hebrew course and soon you’ll be able to get a much more complete understanding of full Biblical Hebrew word meanings. This takes us full circle back to point 1. The King James translators (and other translators for all other translated versions in all languages) ended up using MULTIPLE words in English to translate ONE Biblical Hebrew word. The result being that sometimes we end up with a jumble of ‘foreign language’ words that don’t seem to make sense. Yet somewhere, somehow, there’s a relationship between them. I call that association of words a story. Yes, practically each word, and especially the roots, has a tale to tell. It is these accounts that unlock Bible meaning. There’s an exciting story behind shevet, noah, rosh, lechem and hundreds of other words and roots. Understand that we’re not talking about ‘counting letters’ or ‘hidden code’ or ‘deciphering symbols’ or anything of that nature. While I’m on the subject, when I refer to ‘Hebrew roots’ I am in no way referring to the Hebrew Roots movement which proposes a return to first century ‘Hebrew Roots Christianity’. What I’m talking about here has nothing to do with these organizations and concepts with which I am not associated in any way, shape or form. We’re talking about Biblical Hebrew vocabulary and the dictionary meaning of words. Just like in your native language, if you don’t understand a word, you take a dictionary and look it up. That’s exactly what we’ll be doing. Looking at the meaning, the FULL meaning of Biblical Hebrew roots and words. It’s this full meaning that is the ‘word story’. I will say bluntly, you’ve never heard these stories before. Without these word stories it is impossible to grasp a full understanding of what the A(a)uthor of what we call the Old Testament has in mind. I’l conclude this section by bringing us back to another key principle. As mentioned in point six, there’s a relationship between the three roots yashav, shevet, shoov, they are interconnected, each telling its own story and each being a part of a larger story. This is what I call ‘coherent completeness‘. Well, ‘coherent completeness’ goes much further than that: The 2000 roots are interconnected, not grammatically but figuratively. The 8600 Biblical Hebrew words are interconnected. In the end, I believe, they all tell ONE story. Each ‘Biblical Hebrew word’ is a puzzle piece. In Inventory and Audit of the Universe I turned over all the pieces that constitute our physical and non-physical Universe. Turning them right-side up, giving you an overview of what this Universe is all about and what state it’s in right now. In Origin of the Universe we’re going to turn the Biblical Hebrew words of Genesis over, one by one. We’re going to see their relationship with each other as well as their relationship with the Universe we live in. We’re going to turn Biblical Hebrew words right-side up and make ‘coherent completeness’ out of all this information. The combined and interrelated stories of the Biblical Hebrew roots will tell us the story of our Universe. They will tell us the Origin of the Universe. As I write these words, Dan Brown has just released his fifth novel: Origin. I haven’t read it yet, and will do, but it revolves around a scientist who finds the link that proves the scientific creation or ‘origin’ of our universe and earth. Not sure yet, whether he, or the commentators are saying that once and for all it can do away with religion. Well, in discussing theology, I’ve already commented on religion and what it’s role and influence has been on society. However, behind eliminating religion is ‘doing away with God’ … with a capital ‘G’. The Explanation will help you (not cajole, convince brainwash or persuade–it’s up to you to determine what you think) understand the ‘Bible side’, the Biblical Hebrew point-of-view. 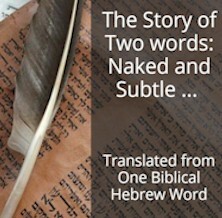 The Explanation, by exploring the Biblical Hebrew, will give you some serious concepts to consider. That’s the goal. You decide what the ‘Origin’ of the Universe really is. Here’s a short example to illustrate this point: In English we could say, ‘the teacher taught a course to the students or learners’. Think about what’s happening here: there’s a subject being taught, let’s say math. One person is ‘giving’ the math and the others are ‘receiving’ the math. The first, the teacher, is the active element. The others, the learners, are the passive elements. In English we use two separate words ‘teach/learn’. In Hebrew we can use the same root with interspersed modifications, like vowels, to express this: melamad and talmid. The root being the lamed, mem and daled (lmd). One Biblical Hebrew root expresses both the active and the passive. Once again, translations are a great introduction to begin to understand the Bible but it is impossible to see the word roots and hence the various concrete and abstract, literal and figurative meanings as well as the word relationships and hence their stories. Translations are limited in their scope. This is something that Bible readers are not aware of and is one point that leads to incomplete comprehension. In the course ‘7 keys to master Biblical Hebrew, a study method to Unlock Bible Meaning’ I’ll expand each one of these keys that I’ve evoked in the last 3 blog posts, by using real Biblical Hebrew word examples. There’ll be Biblical Hebrew word mysteries that you’ll solve, I’ll help you, using the freely accessible online Bible tools. But, the goal of this course is for YOU to ACQUIRE a STUDY METHOD so you can unlock Bible meaning yourself. All I want to do is help you study your Bible better. Here’s the first mystery you’ll crack, in fact, it’s the first conundrum that I ran across in Biblical Hebrew some 30 years ago that helped me develop this master-course to Unlock Bible Meaning applying Biblical Hebrew. Remember that we’re not focusing on Biblical Hebrew per se, Biblical Hebrew is only a means to understand what the Bible is telling us. In the book of Genesis, the Bible states that Adam and Eve were ‘naked’, in the following verse it states that the serpent was ‘subtil’ (old King James English spelling where we’d put ‘subtle’ Gen 2.29, 3.1). Well the ‘mystery’ is that, in Biblical Hebrew, both these words are practically identical (I’d even say identical and I’ll explain why during the course) and definitely come from an identical root (aram). You can use the Interlinear Bible at www.UnlockBibleMeaning.com to verify this. The question is what’s the full story being told by this word and its use in this context in Genesis immediately after the ‘creation’ story … again, I repeat, whether you believe the creation story or not … it doesn’t change the way this story was recorded however longtime ago it was. When you solve this mystery, which we’ll do during the first lessons of the course, you’ll have an answer to one of the most asked questions about today’s society worldwide. I guarantee you’ll be amazed. But even more important than that answer is the Bible study method you’ll begin to incorporate for your own ongoing studies. This blog post is an excerpt from chapter 3.2.3 of Origin of the Universe.